For 2019, the prize categories again cover the ideas stage, through to young and established organisations, and campaigns to influence policy or public opinion towards a more regenerative society. Our diverse panel of judges comes from a wide spectrum of movements representing regenerative design, permaculture, food sovereignty, transition, biomimicry and eco-village networks. For individuals, groups or organisations with a great idea or early stage project less than 1 year old. There are 4 Intentional awards, each of £10,000 in prize money. For groups or organisations who are 1-5 years old and are looking for a boost to expand or develop their work. There are 3 Young Projects awards, each of £20,000 in prize money. For groups or organisations who are seen as beacons – ones that demonstrate success and are standing the test of time. There are 2 Established Projects awards, each of £25,000 in prize money. For groups or organisations that are campaigning or lobbying to influence policy, regulation or public opinion in support of regeneration. There are 2 Influence awards, each of £25,000 in prize money. 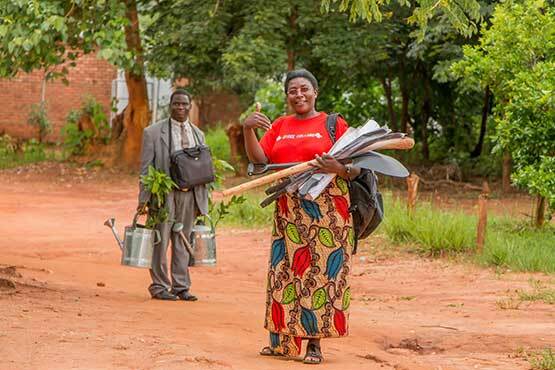 Chimwemwe Chima (left) and Gloria Banda (right) leave a Malawi Schools Permaculture Club teachers’ meeting, having collected their trees and tools for Luwazi school’s Permaculture club. Photo by Kate Walkom.